We had our first real snow in NYC yesterday! I don’t know what it is, but snow in New York is kind of magical when it’s really coming down. It’s almost like being in a real-life snow globe! … But then five minutes later you realize you are FUH-REEZING, you’ve already taken your #SnowyNYC instagram, you can’t open your eyes because snow is pelting you in the face, and you still have 9 more blocks to walk. Those first few minutes though… They really are magical. You’ve got to savor them! Oh my goodness. I love everything about this, Jess! You are so adorable!! Obviously adore the look, and these photos are gorgeous!! Happy snow day! Bean boots are a staple for me during the winter! 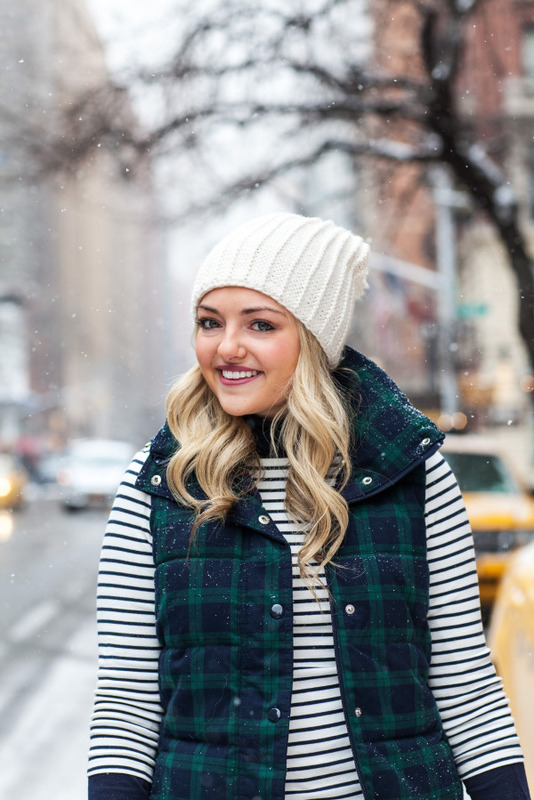 I love the pairing of a striped shirt and plaid vest! Snow in NYC looks so amazing! I wish I was there! this is so cute! i’m so jealous! it snowed here for 5 minutes yesterday and it’s already all melted! 🙁 snow in NYC is magical! Such a lovely and cheerful photos! Also, great casual outfit! i love this look and especially that puffer jacket. there is something magical about the first snow but i am good with no more snow after that first one…ha! Such a great look for a snowy day! It snowed here in DC too and after about 2 minutes I was over it, LOL! These photos could not have turned out cuter! And that NARS lip color was made for you! So cute! I almost got run over by a pickup truck filming an outfit video a couple months ago. Yikes! You’re photos are beautiful; the action shots bring your outfit to life!! Thank you for posting a dose of realism AND optimism for all girls braving snowy weather right now. A perfect balance. Bows and Sequins readers, I have a luxury life+style site that I would be honored if you would check out. Remember, it’s excellent karma to support one another’s dreams. If leave a comment, I will be sure to get back at you, beautiful! super cute. love the mix of plaid & stripes! How adorable! Hope she wasn’t in the way of the cabbie though!! Such fun pictures! Love your gloves! These are just the cutest pictures!! It looks so magical and you have the cutest outfit. Stay warm!! WOW – Great photos. 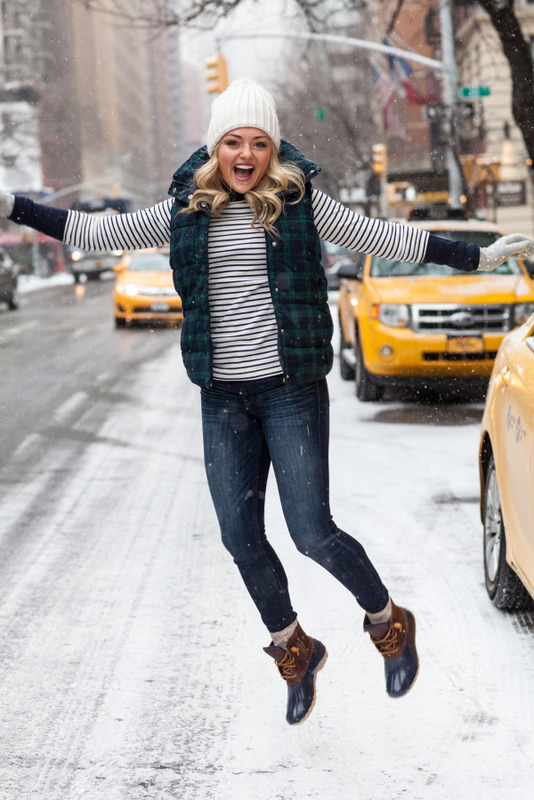 I lived in NYC and you are right….it is magical when it snows. Keep up the amazing work. These pictures are cracking me up! You look like you’re having so much fun! I love your plaid vest! Perfect with the boots! I’m on LOVE with this vest! The plaid is just perfection. Great photos, too. You’re having some fun! Love the bloopers! So glad the taxis didn’t wipe you out! I must have those Kate Spade gloves! This is adorable!! I love the entire outfit! The pictures are also hilarious!! You are absolutely ADORABLE. Such a cute post! The snow jumping pics are awesome! Snow is my favorite thing about winter…but today was just FREEZING!!!!!! I love that vest, Jessica! You look so cute. I’m glad these photos turned out so well despite you having to risk your life haha. Adorable photos. I wish I could be as excited about snow as you are. Snow has never been my friend. Adorable pictures! I wish it would snow in Los Angeles just once! Very cute outfit and you look like you are having so much fun! Love the polka dot gloves, they are so pretty! What a cute vest! Stay warm! Such a great outfit for the season. Love the puffer jacket and lip color. These photos are adorable! I’m sure you provided many smiles that morning to passers by…and PS I hope some of your cold weather makes it out this way! Love your jump picture! I can never get a good one, haha! Love this! I wish we got a real winter in Florida sometimes haha. Obsessed with your outfit too! I love this post! I just got a pair of duck boots for Christmas, and I love finding new ways to wear them. Such a cute outfit! I hope you are staying warm!